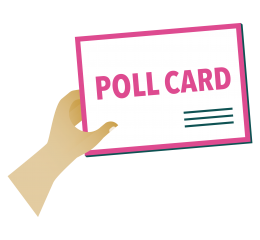 Bring your poll card to the polling station to vote in the district and parish council elections on Thursday 2 May 2019. North West Leicestershire is taking part in a Voter I.D. pilot to help Government learn which are the best methods of preventing election fraud in the UK. When you register to vote you are sent a poll card. Poll cards were delivered between 22 and 1 April 2019. A photocard parking permit issued as part of the Blue Badge scheme. Listen to Cezar! He'll remind you to keep your poll card and take it with you to vote! Please help to spread the word about bringing poll cards to vote on 2 May. As a candidate you will be provided with 'Ask me about Voter I.D.' badges and business cards, which you can give to people you speak to in the run up to the election.